live coast-to-coast. When the gavel dropped, the Hot Rodders Children’s Charity/Goldberg Superbird project car sold for just over a half-million dollars – with all proceeds benefitting the Darryl Gwynn Foundation. The project, dreamed up by football player-turned wrestler-turned TV personality Bill Goldberg, brought together a virtual who’s-who of the musclecar, entertainment and racing industry to benefit the work of former drag racing champion Darryl Gwynn. Goldberg teamed up with Hot Rodders Children’s Charity (offical charity of YearOne), Gillette-Evernham Racing, Barrett-Jackson and MuscleCar TV to create a one-of-a-kind Superbird inspired by the famous winged warriors piloted by Richard Petty in his heyday. Starting with standard ’70 Plymouth Satellite, the crew at YearOne transformed the humble starting point into a stunning Superbird tribute. The YearOne design team spent a considerable amount of time studying and photographing original Superbird race cars on display at the Talladega Motor Speedway museum for inspiration. Gillette-Evernham Racing donated a NASCAR-spec engine and transmission to the project, making a few changes so the race-bred combination would run on current pump gasoline. Even with the changes, the engine still made over 750-horspower on the dyno prior to installation. While the competition drivetrain and extensive chassis modifications and roll cage work scream racetrack, the YearOne crew added all the necessary street equipment to make the car legal for road use. The Superbird build was documented by RTM productions and has been featured on their MuscleCar TV and PowerBlock shows. Additionally, the car starred at the 2008 SEMA show in the Barrett-Jackson booth, and will be featured in a number of upcoming enthusiast magazines in 2009. 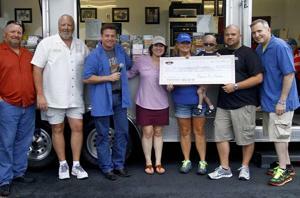 The ultimate goal of all this effort was to raise awareness and funds for the Darryl Gwynn Foundation. The foundation was started by drag racing champion Darryl Gwynn to support research into spinal cord injuries and to assist those individuals suffering from paralysis – particularly children. The Darryl Gwynn Foundation is an Official Charity of the Barrett-Jackson organization, and indeed the auction company provided the perfect opportunity to raise money and awareness at their 2009 Scottsdale event. 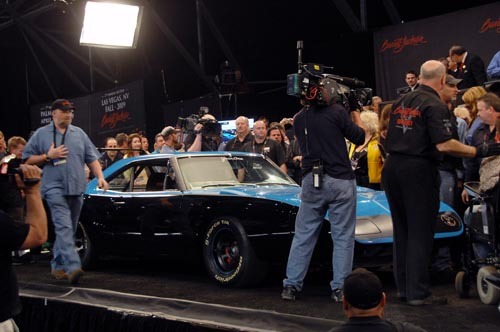 The Superbird drove onto the Barrett-Jackson stage before thousands on-hand and millions watching Speed Channel’s live coverage on Saturday, January 17th. 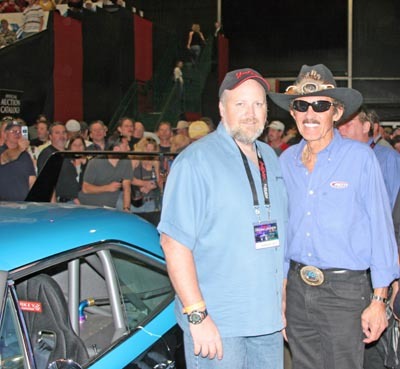 The honor of driving the car into the spotlight fell to none other than living legend Richard Petty, the King of Stock Car racing. 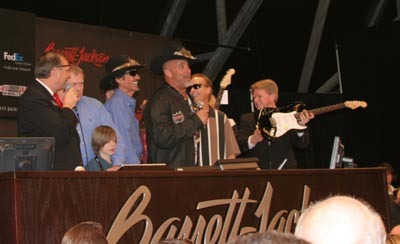 Once the car was situated in front of the huge crowd, King Richard, Goldberg, YearOne president Kevin King, Darryl Gwynn, musician Kenny Wayne Shepherd and other well-known industry and entertainment personalities helped the Barrett-Jackson crew get the auction rolling. When all was said and done, the car sold for an astonishing $501,000, the auction high-point at that time, and an additional $175,000 was pledged to the Darryl Gwynn Foundation. Altogether the event raised $676,000 for the charity. A special thanks has to go out to everyone involved in the project. Hot Rodders Children’s Charity was very proud to take part in the construction of this great car.